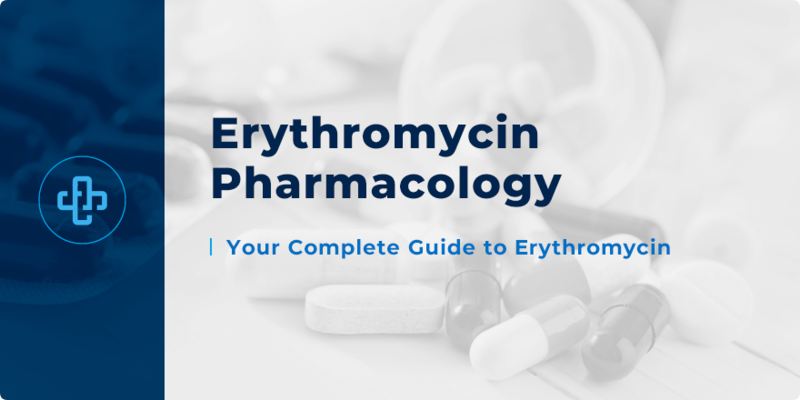 Erythromycin Pharmacology | All the Facts in One Place! Erythromycin is one of the most widely prescribed antibacterial drugs. It terms of its pharmacology – it belongs to the macrolide family; a family whose members also include azithromycin, clarithromycin, fidaxomicin and telithromycin. As a macrolide, erythromycin works as a protein synthesis inhibitor. More specifically, the drug binds to the 50S element of the bacterial rRNA complex – an effect that disrupts production of essential proteins for both structural and functional microbial processes. Erythromycin interferes with aminoacyl translocation – preventing tRNA transfer from the A site to the P site of the rRNA complex. As the A site remains consistently occupied, an otherwise resulting polypeptide chain cannot be formed. Without polypeptides, functioning proteins are not developed. This is the basis of its antibacterial activity. Erythromycin is metabolised by hepatic demethylation, primarily by CYP3A4. It’s primary elimination route is through the bile. It both crosses the placenta and enters breast milk. However, it appears to be safe in pregnancy. It is graded pregnancy category B.
Let’s now review erythromycin’s spectrum of activity, side effect and drug interaction profiles. Erythromycin has a broad-spectrum of activity, active against Gram-positive and some Gram-negative organisms. Later macrolides – such as clarithromycin – have greater activity against Gram-negatives. Erythromycin may also be used for other purposes not listed in this guide. As the therapeutic value of erythromycin is destroyed by gastric acid, the drug is administered as the enteric-coated or esterified form. Erythromycin is associated with its own range of both common and serious side effects. Because erythromycin is a motilin receptor agonist, it has a pro-motility effect on the gastrointestinal tract; a fact that contributes to its side effect profile. It’s this pro-motility effect that makes erythromycin useful in treating gastroparesis (delayed gastric emptying). As with many drugs, some patients experience allergic reactions to erythromycin. Erythromycin is also associated with an entire mosaic of potential drug interactions. Part of the reason is because its pharmacology involves being metabolized by the CYP3A family. Drugs may induce or inhibit this enzyme family, impairing the clinical impact of erythromycin. Erythromycin raises simvastatin levels, leading to an elevated risk of rhabdomyolysis. Increased risk of bleeding with warfarin. Erythromycin increases the side effect profile of ergotamine medicines. At erythromycin prolongs the QT interval, it should not be administered alongside antiarrhythmic drugs such as verapamil and diltiazem. Caution should also be taken with other drugs that prolong the QT interval such as antipsychotics, quinine, quinolone antibacterials and SSRIs. Want to learn more erythromycin pharmacology? Test your knowledge today by joining our member’s zone – instant access to tutorials, flashcards, mnemonics, quiz questions and more! In the meantime, take a few moments to join our newsletter (above) to receive all the latest information direct to your email!